I have been exploring Docker on Windows for a while because I think it is very promising that containers can run on the Windows platform as well. 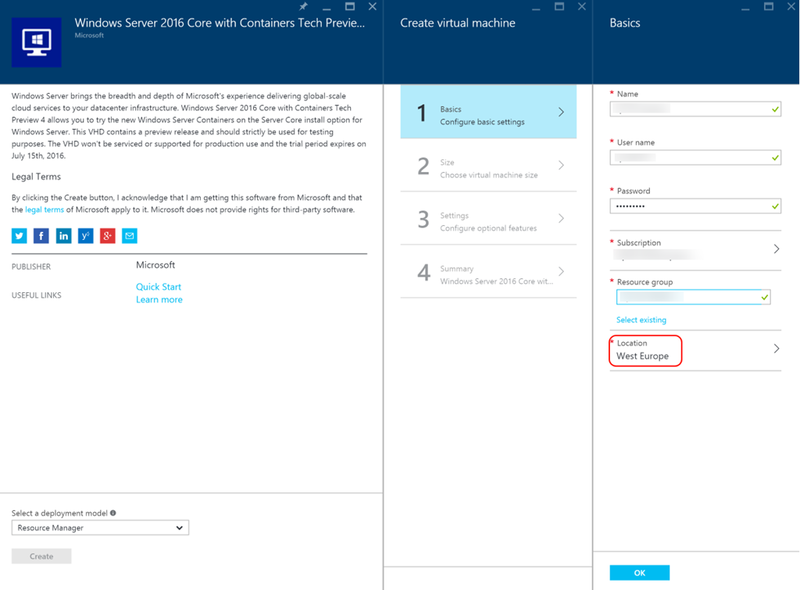 I’ve also written a few posts already about Docker but this one is all about creating a Windows Docker Host on Azure and connect to it. Why does this deserve a blog post? Isn’t that next next finish and straightforward?? Unfortunately no. And that probably exactly why Microsoft created this extension for Visual Studio which does that for you. The extension in Visual Studio allows you to publish a ASP.NET 5 application to Docker. When choosing that option you can create a new Virtual Machine on Azure. When you do that, a whole bunch of stuff is done. Magic. But in the end you can connect to your new and shiny Windows Docker Host. I did that, and it worked fine. But then I wanted to allow a colleague to connect to my machine. And I wanted to connect to another Windows Docker Host of someone else. Or publish my ASP.NET application to a Windows Server Container Image I had already created….And then it started to hurt. The magic did more than creating a VM, it also created certificates, injected them into the Virtual Machine and reconfigured the Docker host on this machine. Because I wanted to understand what happened I made it my goal to be able to connect to a Windows Docker host that I created without Visual Studio. At Xpirit we have an Innovation Day every 2 months. During this day you can work on whatever you like and in the end present it to your colleagues. This was my project, and here are the results. The Windows Docker Host is running in the cloud. Because you want to do things on this server remotely, your workstation (with the docker tools for windows installed, which you get with the VS extension), must have a connection to this machine. Because you need to interact with a remote machine, you need certifcates on the host machine and your own machine to be able to talk to each other. Choose Resource Manager as your deployment Model. Fill in the details. Notice the region where you are creating this, because you need that later. Now that we have created the certificates, we want to upload them to the Docker Host. But how? Because we need certficates to communicate with the server and we first need to upload them. This part took me the longest to figure out, but I will try to explain. When Microsoft creates the Virtual Machine with the Docker extension, it uses a ARM (Azure Resource Manager Template). This template contains a parameter for a certificate and some scripts. When creating the image, it uploads the generated the generated certificates to a temporary Azure Storage Account and then “injects” them in the image that is created, This means the certificates are already in place when he image is generated. Write-Host "Upload Certificates + Init Script"
Then the moment of truth. Test if it works. If you see the two windows server core images listed, you are good to go ! Hello Rene, Thank you for a very useful article. When i run the upload script i get the following error. Can you please let me know what could be the issue?